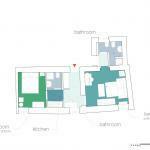 Enjoy the apartment very central with everything needed. Think I have just used the smallest shower ever but the other shower room more than made up for it. The person that greeted us at the apartment allowed us to leave our suitcases until we were going ho the airport. Great service. 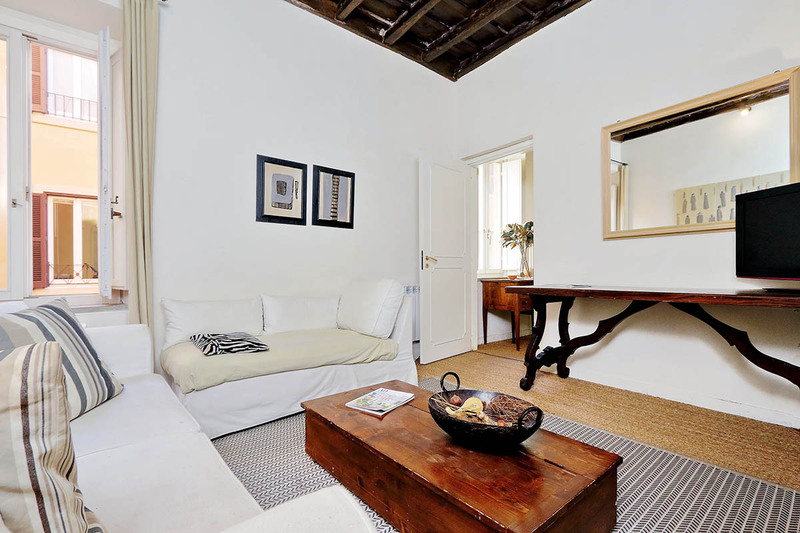 This elegant Rome apartment for rent is situated on Via di San Vincenzo. We also manage five other apartments in this building. This is ideal if you are traveling together with other groups of people. You can rent these units together when available: Trevi charming apartment, Trevi house apartment, Trevi stylish apartment, and Trevi lovely terrace apartment. This apartment is located on the 3rd floor of a historic building which does not have a lift. This flat can host up to 4 people. 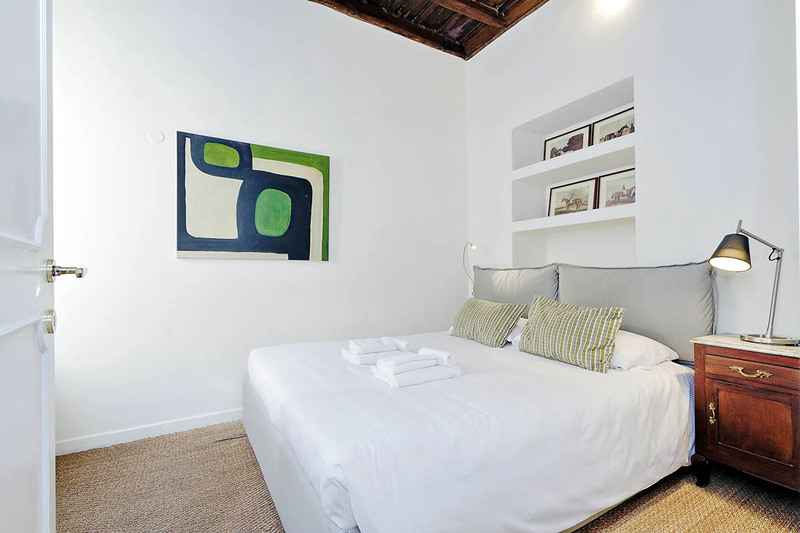 Guests will have access to a charming living room, a master bedroom, a bathroom and a kitchenette. 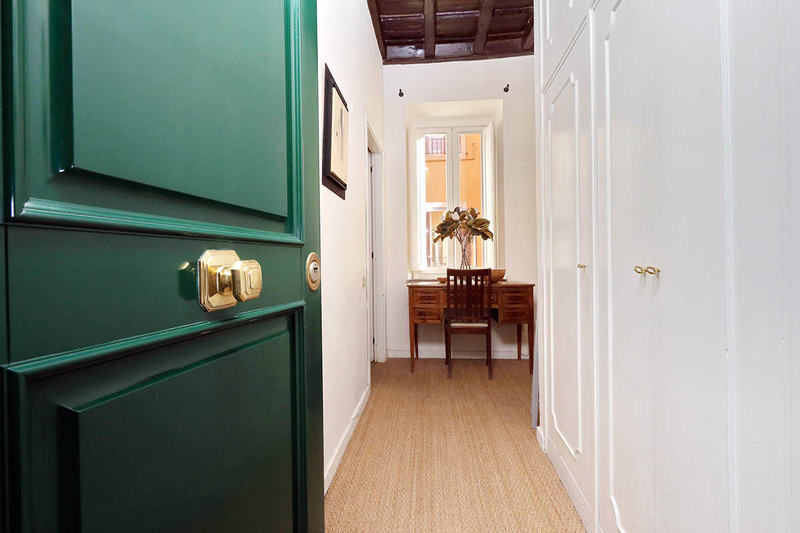 The elegant entrance has a large window that fills the room with light as well as an antique desk, chair and wardrobe. On the left of this entrance you will find a living area. Guests will enjoy its light, neutral colors which create a light and airy space. The living room has a comfortable white sofa bed which can easily accommodate 2 adults. In the same room there is also a lounge chair, coffee table, flat screen TV, beautiful paintings, and reading lamp. You can enjoy a meal together at the large wooden table with chairs. 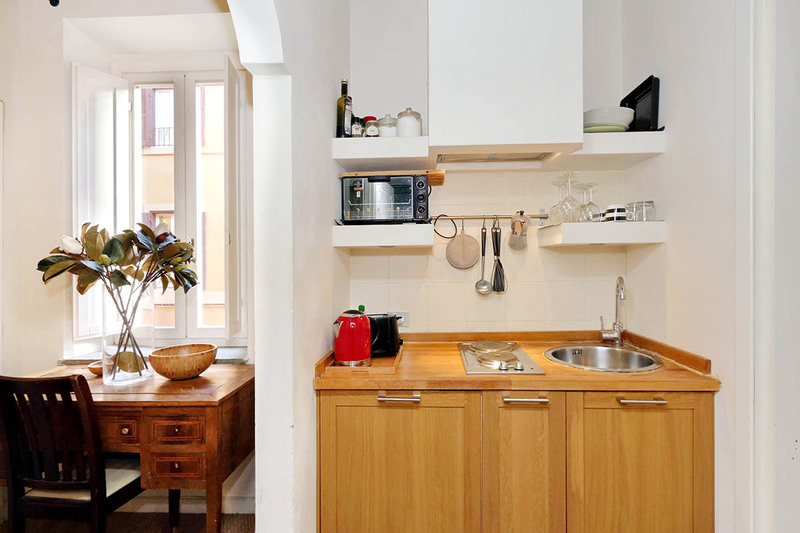 To the right of the entrance you will find a well-equipped kitchenette with electrical stove, fridge and freezer. In the kitchen you will find the perfect setting for preparing meals. You will find it easy to create wonderful dinners with local ingredients. 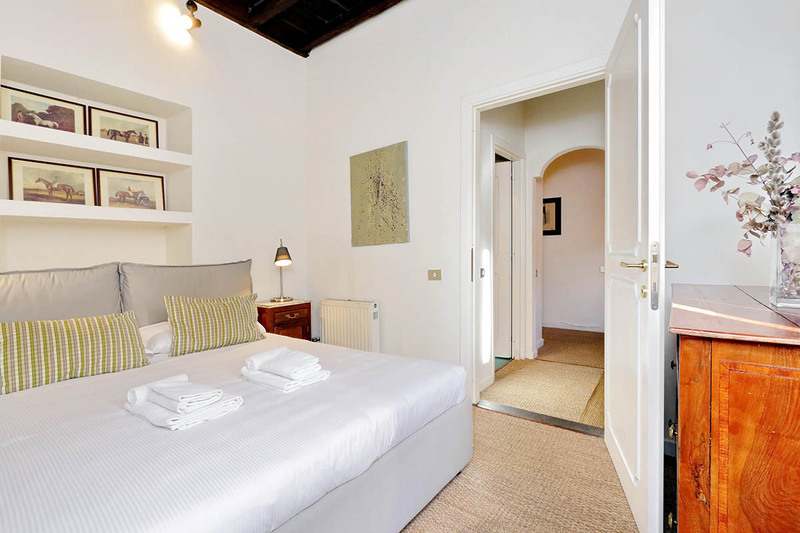 The large window of the master bedroom, overlooking via di San Vincenzo, creates a very bright and light atmosphere. It has a king-size bed, night tables with lamps and an elegant dresser. 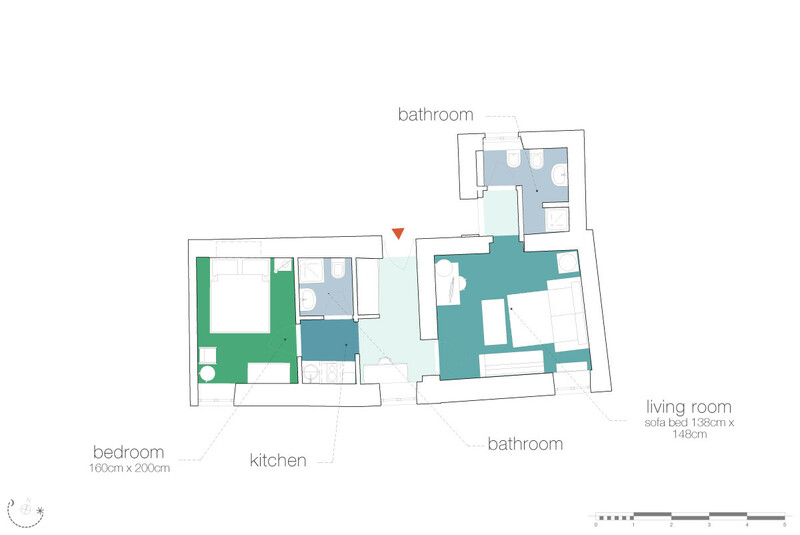 The apartment has 2 bathrooms, which makes it well-suited to groups of friends. Both bathrooms are equipped with a shower box. 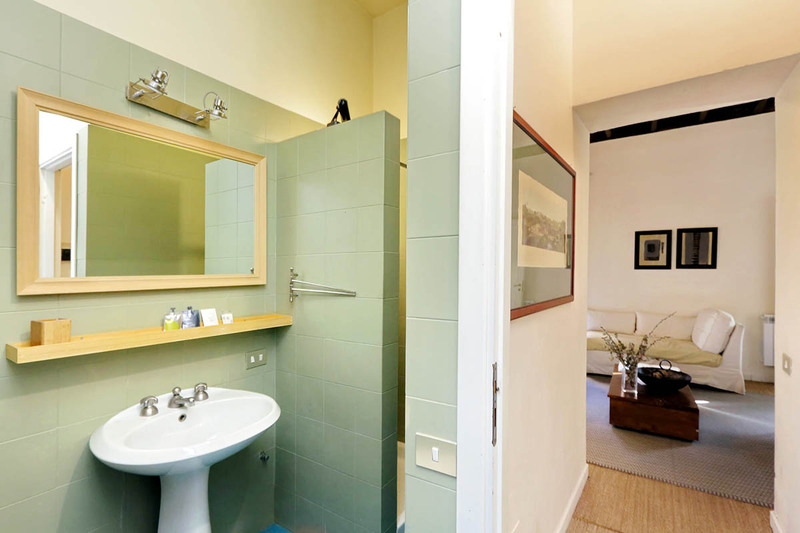 The apartment also has useful amenities such as an air conditioning system and Internet Wi-Fi access. 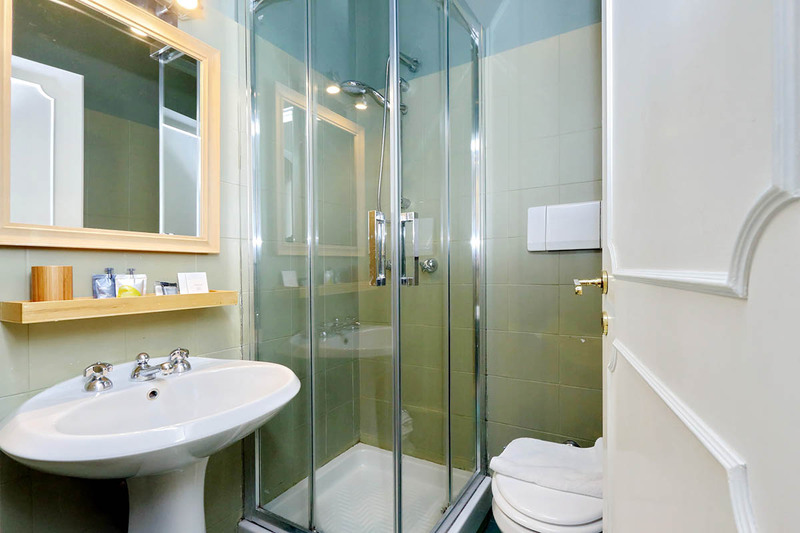 The location of this Rome apartment for rent will allow you to experience the Trevi fountain in a unique way. For example, late in the evening you can marvel at its beauty without the throng of tourists. This location is one of the most famous areas of Rome. With the Trevi Fountain nearby, you are in a truly cinematic landscape. We highly recommend visiting the fountain late at night. There will be much fewer people pushing in to get a photo, and the beautiful nighttime illuminations add something magical to this already majestic monument. This fountain aside, you are also very near the Spanish Steps and the Villa Borghese Park. These two attractions are purely picturesque, and offer great views out over the city. Within walking distance you will also find the Piazza Venezia. This holds the impressive Altare della Patria. From here you can also walk to the Roman Forum and the Colosseum. Moreover, heading more to the West, you will get to the Piazza Navona area. This is a great place to visit in the evenings. It has many bars and restaurants, where you can enjoy typical Roman dishes, or a classically Italian aperitivo. Once you are here you will also be within walking distance of the Vatican and the stunning Basilica dedicated to St Peter’s. Good location. Good staff. Good bed & kitchenette. Good hot water & heating. You know the little problems re size of shower & small bathrooms. Needs a new shower head in the 2nd shower & there are minor leaks to vanity taps. Perhaps it needs a table to eat at and a new main sofa. We were surprise that in such a solid building the ot...Read Moreher guest could be heard. Upper level above needs a softer floor covering to reduce the sound of walking around the top floor unit being heard in this unit. We had a pleasant stay, thanks. Apartment 5 - in the small shower room next to the kitchen there is a leak possibly from the sink that left a substantial amount of water on the floor in the corner where the bin stands. This looked as though it had been there for some time as the bin was stained, we had to leave a towel on the floor to mop up the water. One of the lamps beside t...Read Morehe bed in the bedroom did not work. In the bedroom the carpet at the bottom of the bed on one side is wearing and a trip hazard. The work top around the kitchen sink was in very poor condition. One cup and one plate were both chipped which is unhygienic. There is also a noticeable smell on entering the apartment. I only mention the above issues as they may not have been previously reported and need attention. We were happy enough with everything about the hotel, but were extremely disappointed with being charged 25 Euro cash for checking in on a Sunday (17th September - 22nd September). There is nowhere that mentioned this. We understand the tourist tax 3.50 pp/pn and check in fee within the hours listed (8;30pm -10am) but we can't see where it s...Read Moreays anything about 25 Euro for checking in on a Sunday. Very unimpressed when we get hit up for 25 Euro cash the moment we check in! Also, the same guy told us to put our room rubbish around the back of hotel and another hotel guy got angry with us for doing that. We told our contact and he said it was ok, he would talk to him about it. Also, when the contact arrived and asked for 25 Euro, he was in such a rush to leave that we never even got around to asking about the air-con and it wasn't working when we tried to use it. We messaged him and he said he would send someone out, no one turned up, we messaged him again and someone turned up. It turned out it just wasn't plugged in. If he waited a few minutes after we checked in he would have known this and fixed it for us when we tried to turn it on. Also, he was in such a rush he messed up the charge for the room on his payment machine, then a few days later said we had to meet him back at the room to redo the payment, we waited 3 hours for him, he didn't turn up so we went out again, then he turned up a few hours later. Basically, we were happy with the room etc but were very disappointed with being charged to check in on a Sunday and also with having to be available to fix things that should have been fixed when we checked in. Nei bagni mancano degli appendi abiti su cui mettere gli asciugamani della doccia. It was a comfortable apt. In the heart of Rome. 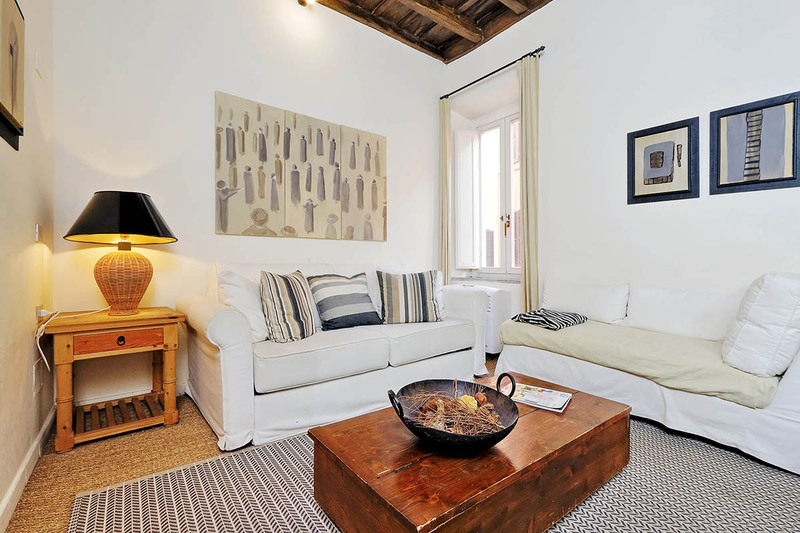 A place in an excellent, comfortable for relaxing in the historical center of Rome setting. Many thanks to ROmeloft and Sibilla, who was very helpfull! We stayed at Trevi apartment 20 seconds by foot from Trevi fountain. The apartment is tidy and bright, more, than spacious for 2 people (could be fine for 2 couples). 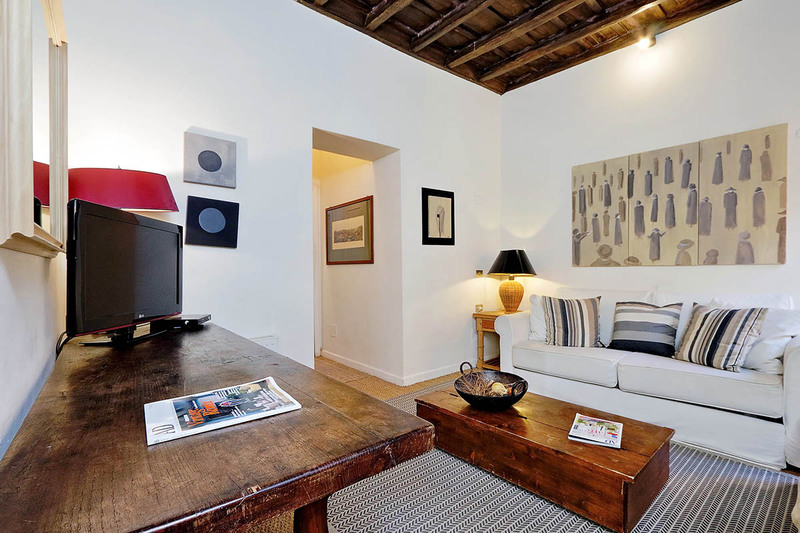 Location can not be better especially for those who visit Rome the first time, all the citycenter is nearby. Already miss...Read More that apartment as if it was our own. Thank you again and greetings from Russia! Sijainti ja henkilökunta 10. Kuluneisuutta, siivous 7.5. Hyvän kokoiset sängyt, tuplapeitot. Suihkukaappi aikas pieni. Jyrkät rappuset. Kaiken kaikkiaan tyytyväisiä ja tultais uudelleen. Kiitos! The apartment is in a great location within walking distance of historic sites, restaurants and the metro station, will definitely be back! The bathrooms had mold and the couch was filthy....also there was a smell to the straw rugs. However it was a very charming and well situated apt. The guy who greeted us was super late and was talkkng about his personal problems he was sweet but need to refrain from his personal stuff.....had a great experience overall with rome loft........the s...Read Morepanish steps the week before was superb in every way!!!!! thank you! In this place we were second time.Next our vacation willl be in same place.Thank you romeloft ! Apartment was spacious and comfortable very clean and central to everything in Rome, felt like a home away from home, would highly recommend. We really enjoyed our stay in the apartment. Spacious apartment for 3 people and really nice furniture. 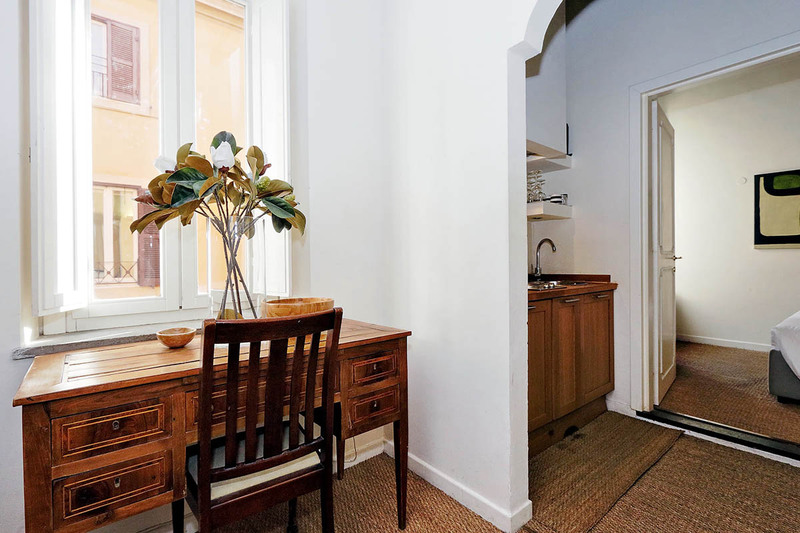 Right in the city center, close to the Trevi fountain,spanish steps and the Pantheon. Overall the quality of the apartment was good. Romeloft staff - 'The following problem has been fixed':The only downside to the apartment was the ba...Read Morethrooms. It can do a with a little bit of renovation (althought it was clean it looked always dirty). The lighting and water pressure was poor and the the hair dryer was also broken. One inconvenience was that the apartment has only one key, which meant we had to organize ourselves if the family split off. If these things are addressed, I would recommend this apartment again. We enjoyed our time there,but wouldn't go back to the same place again due to the disadvantages mentioned above.